Sunnyside Dru: what is in a name? My father had 3 siblings. His sister, Dorothy, died when still a teenager. My dad, James, passed away from cancer when he was 50. His brother Edward lived to be in his early 90's. And his youngest brother, Nade, turns 88 today. Nade Otis is his name. There are a few things in life I'm not certain of, and the origin of my uncles name is one them. 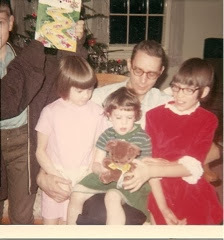 My siblings all have names that are fairly easy: Jane, Arthur, Jennifer, Jeffrey, Steven. And then my name is Drusilla. I have some vague memories of my dad saying that the family names were given to my older sisters, and mine was a character in a book my parents had read. My husband is Homer. His siblings are Patricia, Sandra, Jack, Jerry, Gary. For decades he was under the impression he was Homer Jr, named after his father who had been named after the doctor who delivered him. Then we visited one of his cousins who had done family history, and was told his name had been in his family for 13 generations, back to the Massachusetts Bay Colony. Nade, Homer and I all gave our kids standard names. No fancy spelling. Girls with girls names, boys with boys names. No explinations of spellings, or in my case, yes, I bet you were expecting a guy with the name Drew, but I'm a woman with the name Dru, a nickname for Drusilla. Happy birthday to my Uncle Nade. 88 years is a cause for celebration! Rhubarb pie for everyone! That's my uncle Nade, with my cousin Linda in pink, Sue in green, and me in the red.